Excellent product adjustable temperature control. Proofing has never been so easy. This mixing bowl is designed for use with KitchenAid Professional, Professional Design Series and Pro Line bowl-lift stand mixers. 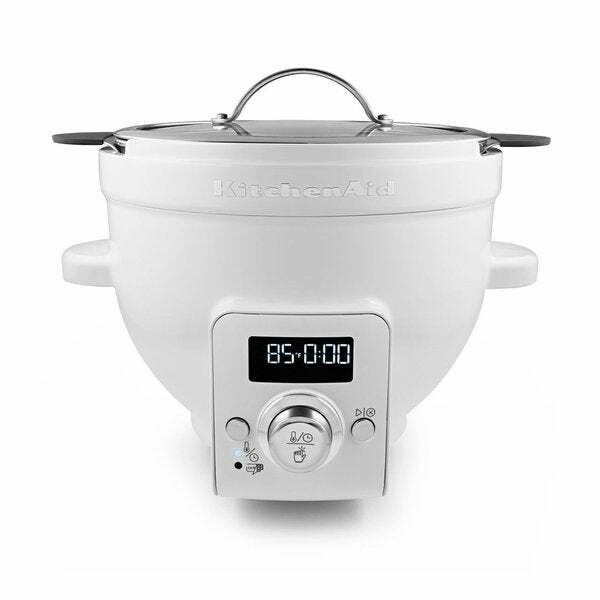 Double-wall insulated work bowl is ideal for mixing and heating ingredients without scorching or overheating. The KitchenAid precise heat mixing bowl is great for chocolate, bread and cheese. Temper chocolate, proof bread dough, make fondue, soups, yogurts and more. Can also be used as a stand-alone unit without mixing function. Wife loves to bake and decorate. While it took a little learning of the controls and the process, this thing is impressive. It takes the struggle of heating things to the proper temp and maintaining it while you try to decorate. It cuts down on the stress to the wife and makes baking more enjoyable for her. She is now more enthused to work on other baking skills while using this. Great accessory to my Kitchenaid. I bought this mostly for making yeast breads. Proofs the yeast great and keeps the perfect temp for raising the dough. Breads done in record time. Love it. Well I bought it for my wife to make some chocolate treats but so far we have only had queso. It seems to work like an exact temperature crockpot. Only one that you have an automatic stir option, very cool. Totally awesome attachment. Would definitely recommend to bakers or anyone. "Does this work with the KSM150?" "How does the attachment work for tempering chocolate? Is there a special beater that scrapes the side of the bowl? Do you need to manually set the temperature, then manually reset the temperature or is it automated?" "Will this attachment work for chocolate pie filling"
Yes, this will work for the chocolate pie filling. I hope this helps. "will this bowl work with my lift up mixer?" Hello codyss12, yes this works with the Kitchen Aid Bowl Lift Stand Mixers. Have a great day!